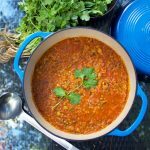 I’m a very big fan of this Moroccan Lentil Soup. It’s got so much to love – it’s thick and creamy, hearty, healthy and colorful, and it’s flavored by the beautiful, warm, fragrant spices that characterize Moroccan cuisine. I discovered this soup when I attended a cooking class on Mediterranean Street Food at Sofra Bakery and Cafe in Cambridge. My cooking teacher that night – Cara Chigazola – is the Chef de Cuisine at one of my all-time favorite restaurants – Oleana – also in Cambridge. I was thrilled that Cara gave me the recipe and permission to share it here on Panning The Globe. It was fun to hear Cara speak about her travels and her love of street food. She told us about a trip she took to Morocco and how she discovered this amazing soup and had to recreate it when she returned home. I know exactly how she felt! After I tasted her version I wanted to make it immediately when I got home! So did my friend Meryl, who took the class with me. Start by chopping and sautéing a mirepoix of carrots, celery and onions, along with a good amount of minced ginger and garlic. Next add the ground spices: turmeric, cinnamon, paprika and red pepper. Stir the spices around in the pan for a minute or two, until they’re lightly toasted. At this point you’ll be inhaling the beautiful aromatic flavors of this dish and you might close your eyes and take several deep sniffs and start sighing, as I did. Lastly, add the tomatoes, lentils, chickpeas, and herbs. Now all you have to do is let it simmer for about a half hour…. 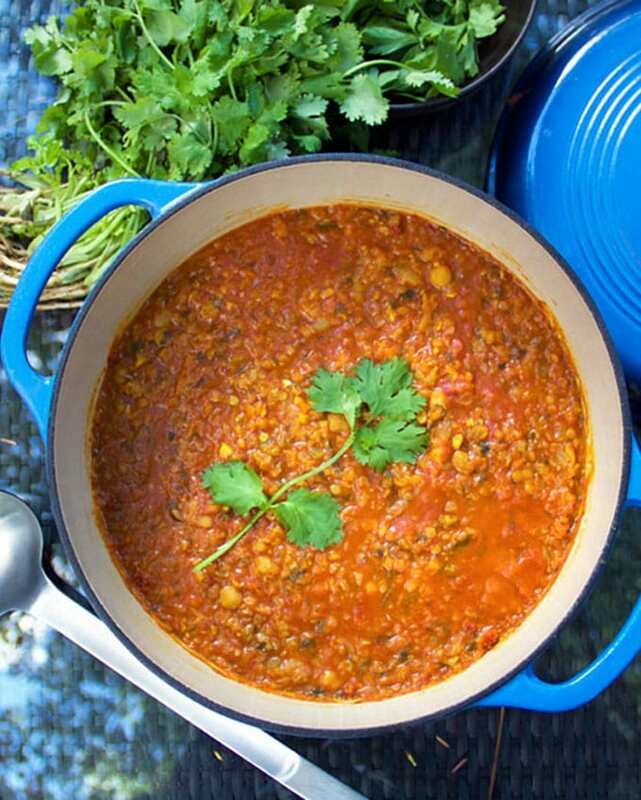 This Moroccan lentil soup is hearty enough to be a main course. Cara suggests garnishing the bowl with a wedge of lemon to squeeze in, and a date. You can either chop the date, or just put it in the middle of the bowl and scoop up sweet bits of it with each spoonful of soup. If you live in the Boston area, cooking classes at Sofra are a very special treat that I highly recommend. Imagine stepping into a warm Middle Eastern cafe at 6:30 in the evening. Pour yourself a cup of tea and get comfy on one of the kilim-covered benches. As you watch the chef prepare the food, intoxicating aromas will float your way and you will be seriously craving the scrumptious dishes that are being created. Your wish will be answered with a delicious serving of each dish, along with the perfect wine pairing. Here’s the link for information about Sofra Bakery, Menu, Catering and Cooking classes. Update! Chef Cara recently opened a Honey Road restaurant in Burlington Vermont. It’s getting great reviews. I can’t wait to check it out next time I’m in Burlington. 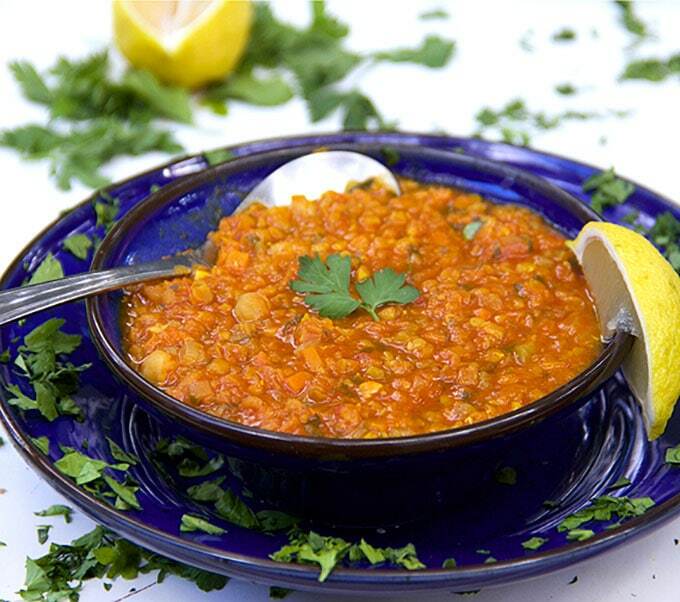 Here’s the recipe for Moroccan Lentil Soup: Harira. If you try this recipe, I hope you’ll come back to leave a star rating and share your thoughts in the comments. I’d love to know what you think! 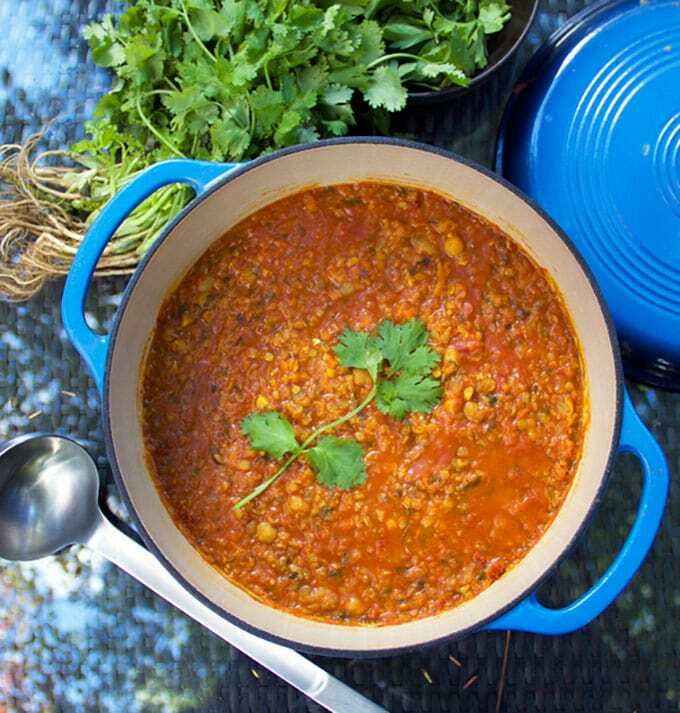 Beautifully-spiced soup of lentils, chickpeas, vegetables and herbs. Hearty enough for dinner. In a large heavy pot or Dutch oven, warm 2 tablespoons olive oil and sauté the onion, celery, carrots, garlic, and ginger over medium-low heat until they soften, 5-7 minutes. 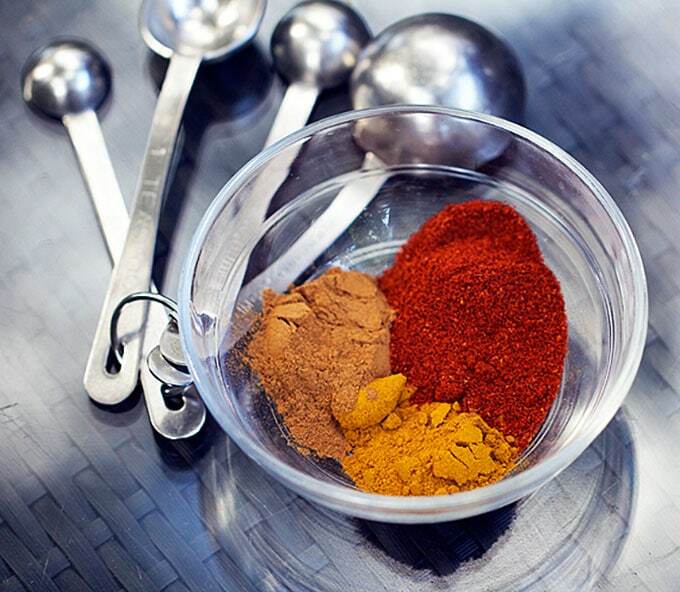 (Don’t let them brown) Add the spices: turmeric, cinnamon, paprika and pepper. Cook, stirring, for 5 minutes, to toast the spices. Add the tomatoes and chicken broth (start with 7 cups and add more later, if you want a thinner soup). Bring to a simmer. Add the lentils, chickpeas, cilantro and parsley. Simmer, uncovered, for about 35 minutes, until the lentils break down and the soup becomes thick and creamy, adding more broth if you want a thinner soup. Season, to taste, with salt. Serve with lemon wedges and dates. I made this soup last night. Contrary to my normal tendencies, I actually followed the recipe verbatim. It came out amazing! The combination of spices, garlic and ginger is perfect. This soup is so flavorful and delicious. I’ve already made it 3 times in the past few weeks. I double the recipe so I can take it to work throughout the week. Thanks for the recipe! Made this soup twice within 3 days once for my family of 6 and then for a lunch church outreach for 40 and both times had rave reviews with eithet none left over or eaten quickly the next day! I made this last week and packed individual servings in mason jars to eat throughout the week for lunch/dinner. The flavor and texture was amazing every time! I love the thought of a fridge filled with jars of soup ready for reheating. I’m really glad you enjoyed the soup Erica – it’s one of my favorites! I made a double batch of this last night using normal lentils (I didn’t have red). My husband raved over this recipe! I froze about half – I’m hoping this freezes well. I was able to use garbanzo beans I had in the freezer and some celery I had on hand. Served this with salted toast. Delicious! Is this soup good re-heated? I’m going to serve it for dinner and would like to prepare the night before if possible. Thanks! YUM YUM..ingredients were purchased before I saw the Top 10 (pure luck cause we would have jumped over to the ones we hadn’t made yet) and the soup was awesome, amazing, delicious. Loved the texture, flavor, spices, and overall taste. For sure will make this one again. I’m so glad you made the lentil soup Joel – isn’t it amazing?! It’s one of my favorite recipes. I hope you won’t let the “top 10 list” dissuade you from browsing around and finding what appeals to you. Happy New Year! This soup is a hearty and delicious dish to bring to a dinner party for the vegetarians in the group. Perfect with a salad. It is also the most flavorful lentil soup I’ve ever tasted. And it’s quick and easy to make. Thank you, Lisa! This soup was outstanding! First recipe from your blog, and we have enjoyed searching this evening given this recipe’s success. Can’t wait to make more! 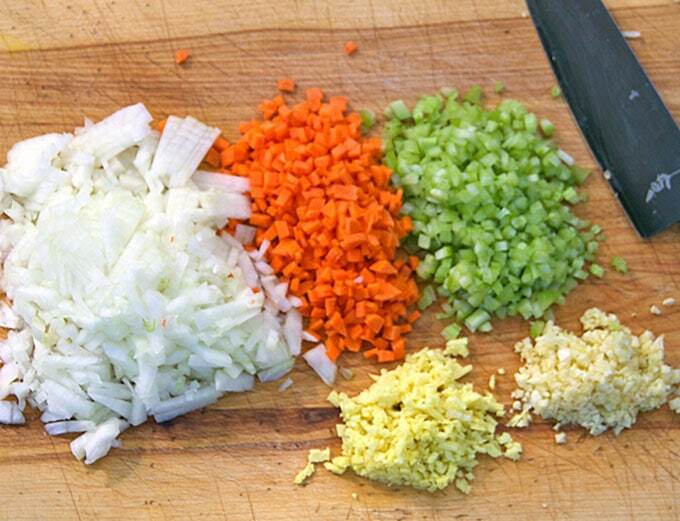 anything that begins with a mirepoix containing ginger and garlic? is my kind of recipe. 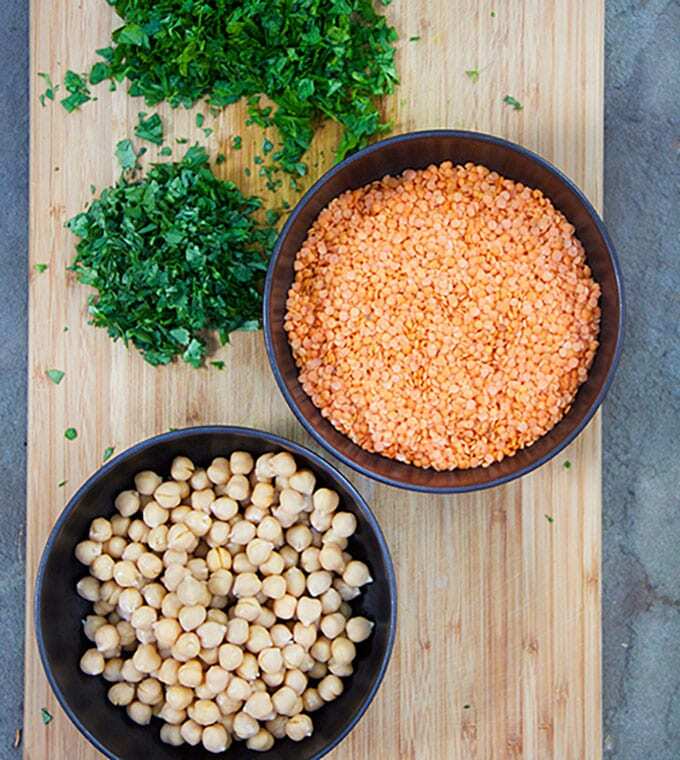 we love these flavors, and lentils – saving this to make soon! My husband has been requesting more moroccan dishes ever since I made a stew that he liked! Ill have to give this one a try! Fall is in the air and I remember making this delicious soup last fall. It is so hearty that with a salad and a hunk of crusty bread it makes a wonderful light dinner. My friends loved it! Thanks Lisa. Hi Lisa. I made this soup yesterday afternoon, the house smelled amazing while it was simmering. It was wonderful and most definitely on the “make again and again”list. I am so happy that I found your blog, I have made several of your dishes and have loved everyone of them. Thank you so much for sharing!! Hi Jane. 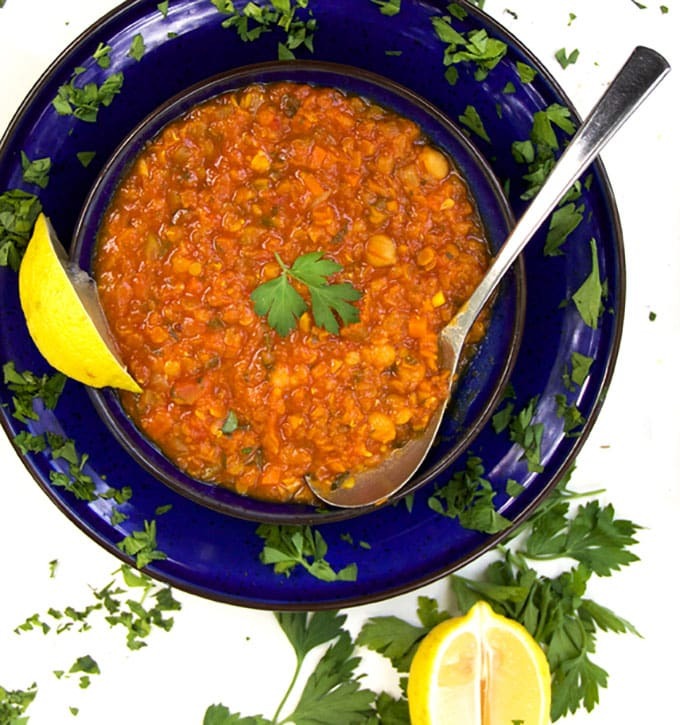 I’m so glad you enjoyed the Moroccan lentil soup and other recipes – I love hearing that 🙂 Thank you! We love lentil soup here. I don’t cook with red lentils much (only because my grocery store doesn’t carry them) but I just picked some up at the Lebanese market when I was there the other day. I need to try this! I’ve been to Oleana and loved it. This soup looks amazing – have to try it. I have to try it – maybe with the date suggested by another of the commenters. Lisa, this is becoming a regular dish around the house. However, I substituted the tomatoes in tomato juice with canned tomatoes in TOMATO PUREE. They’re a little harder to find but way worth it. So glad you’re all enjoying the Moroccan Lentil soup, Julius! Our household loves it too. What brand makes the Tomatoes in Puree? I’d love to try them. I tried this last night, and it was excellent. I made no changes other than adding an extra carrot, because I just felt like adding a little extra veg. The flavor was lovely, and the addition of a bit of lemon and a chopped date to the finished product really elevated the dish. A perfect addition to my New Year detox diet. I’ve made this twice and loved each batch, such a great blend of flavor. Big hit with my husband and sons. This weekend I’m going to make your Colombian chicken soup, can’t wait! I’m so glad you and your family enjoyed the Moroccan Lentil Soup! My family loves it too! Harira is traditionally eaten to break the day’s fast during the month of Ramadan in Morocco. At that time, you can see Moroccans in restaurants with steaming bowls in front of them, waiting for the Muezzin to call that the sun has set. In the old times before digital clocks and weather radios, the muezzin would determine when it was dark by holding a black and a white thread in his hand. When he couldn’t tell the difference, he gave his call. I have been looking for this recipe for years! I once lived with a Morracan during Ramadan and loved this soup! Can’t wait to try it. Lisa, We love (Jim and I) this soup! So easy to make, and so delicious! A hearty meal on a cold fall night. Thank Lisa for sharing this and all your creative recipes and ideas. Thanks for the comment Deb! I’m so glad you and Jim enjoyed the soup! This soup was amazingly easy to make..the aroma was heavenly…the flavors so good. I will make this again and would certainly serve to company. I just ate a lentil soup that I was mildly disappointed in. I think I would be wildly enthusiastic about this one. I agree with all your adjectives in regard to a particularly well made, well seasoned lentil soup. I envy you your cooking class by the way. Thanks for sharing! This looks so delicious and perfect for this time of year. Can’t wait to make! Thanks, Lisa! So delicious!!! I have already made this twice since we went to Sofra. It really is easy and yummy. The class at Sofra was such a treat and Cara was wonderful!!!! They also paired a rose’ wine with this soup. Not something I would have thought to do, but it was very good. Thank you, Lisa, for the wonderful experience. Can’t wait to make this! May drive the 3 hours for the Sofra class one day! It would definitely be worth the drive! Hmmmm…yummmmm…might just be dinner tonight. I have heard so many good things about Oleana. My husband has been there many times during his business trips to Boston. I want to check it out next time I’m there! By the way, this soup looks so good and hearty…perfect for the season! Let me know next time you’re coming to town Amy – it would be great to see you! Also, when you’re here you might want to try Ana Sortun’s newest restaurant – Sarma – for some amazing Turkish Meze. It’s become one of my favorites!!! Thanks Lisa! My husband is in Boston this week and I forwarded your recommendation! One of these days I have to make back up to Boston….hopefully before my college reunion in 2016!